I always have trouble with eating during one specific part of the day. I normally am just getting off work, or just showered after a long run, and I am starving. It isn’t time to eat a normal meal, which means it’s “snack time”. I don’t know why I struggle with snacks so much. Nothing sounds good, or it will take too long to make, or I don’t have it already in the house…. can you tell I’ve whined about this before? I can’t even count how many times I’ve made Ryan get in the car to go buy a snack. After this last time, I decided it was time to take a stand versus my inconvenient snack problem! 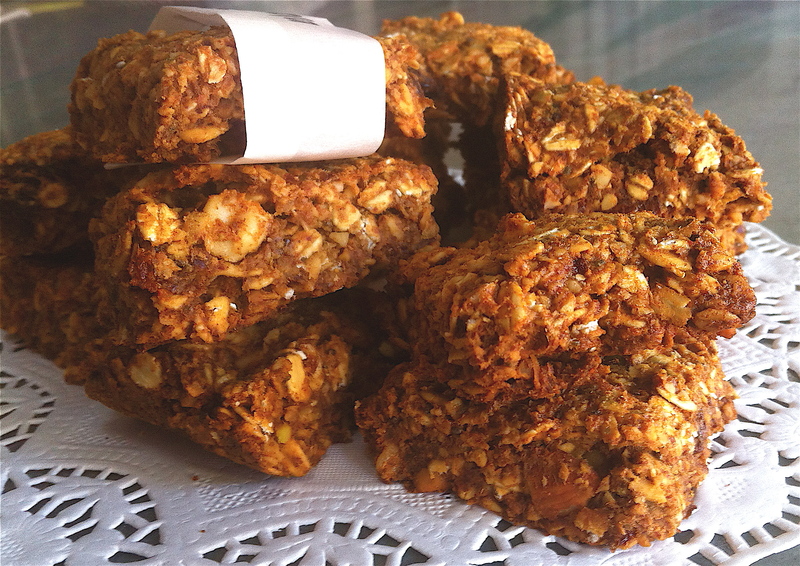 I found this granola bar recipe when I was patrolling the internet for gluten-free recipes. I have people request them all the time, and I like to keep my eyes open for creative ideas. I have to say, that I love this recipe, gluten-free or not! It’s very DIY, so you can mix and match the mix-in ingredients in any way you choose. If you are a bulk shopping addict like I am, it’s very easy to mix it up. These granola bars have a very similar texture to Nature Valley bars because they are baked twice, but the composition is more of a KIND bar. They are crunchy with a nice hint of natural sweetness from the dates. 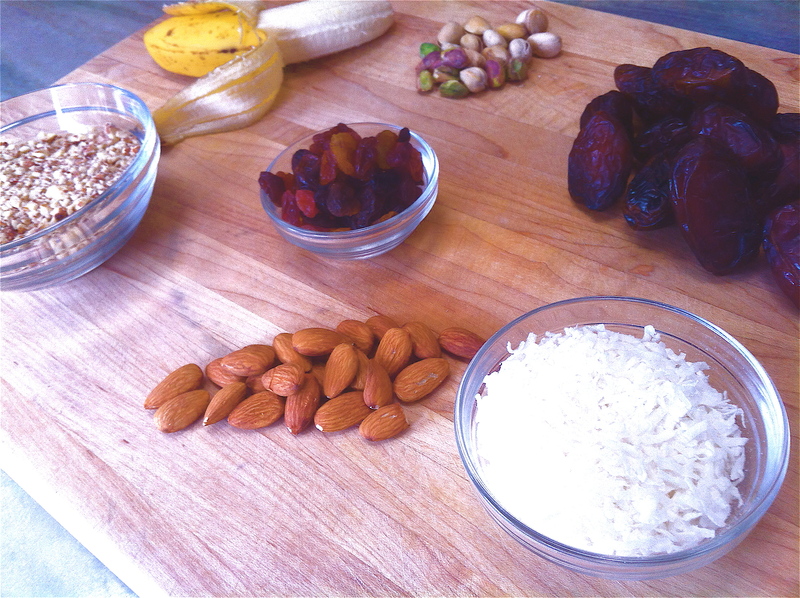 I used a lot of nuts and seeds for the mix-in ingredients, and less fruit, but you can make them as sweet as you want! What I like most, is that I get a little bit of everything when I eat these: protein from the peanut butter, carbs from the oats, and fiber from the nuts and seeds. I actually feel full after eating one! I keep the batch in the freezer and pull them out as I need them. They take a few minutes to thaw out, or taste really good hot out of the microwave. Heat 2 cups of water to a boil and add the dates. Let them soak for 3-5 minutes, while you prepare the rest of the granola bar batter. 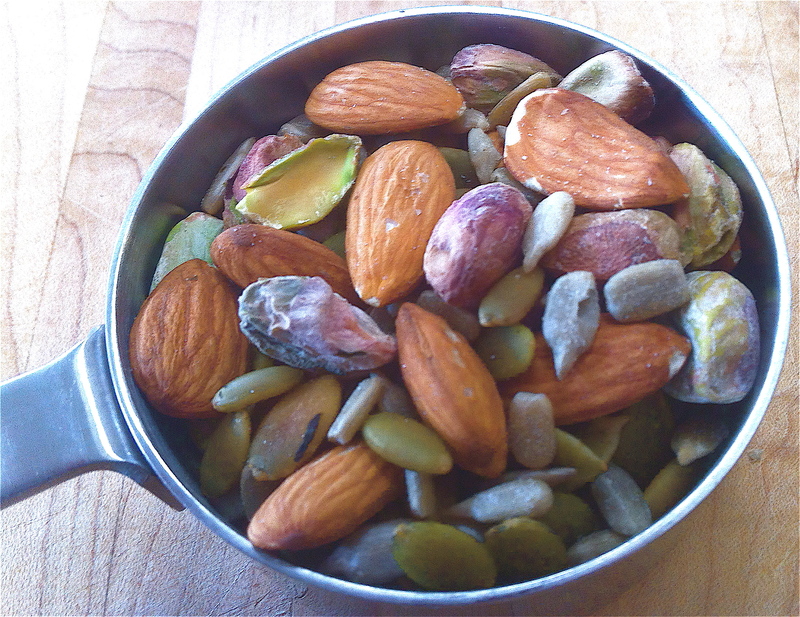 Put the 2 1/4 cups of mixed nuts and seeds into a food processor. Pulse the mix until it is ground into a crumbly flour-like consistency. Remove from the processor. Add the remaining ingredients into the food processor. Process until it is a thick, creamy mixture. Add the nut-flour mix back into the processor and pulse until it is combined. If the mixture looks really dry, add 2 tbs of water. Spread the granola bar mix into a 10 x 6 inch baking dish that is sprayed with cooking spray. Bake for 30 minutes. Remove from the oven and cool for about 10 minutes. Cut the bars into 1.5 x 3 inch pieces. You should get 12 bars with a few edges to munch on. Remove the bars from the baking dish and put them onto a sprayed cookie sheet. Bake for another 5 – 15 minutes, depending on your desired crunchiness. 5 leaves a soft interior, 15 is crunchy all the way through. Cool completely before wrapping and freezing. Previous postOne Lovely Blog Nomination & More About Me!